It’s the last week in June so what are you doing? I know I bet you’re packing for San Diego for Comic Con right? 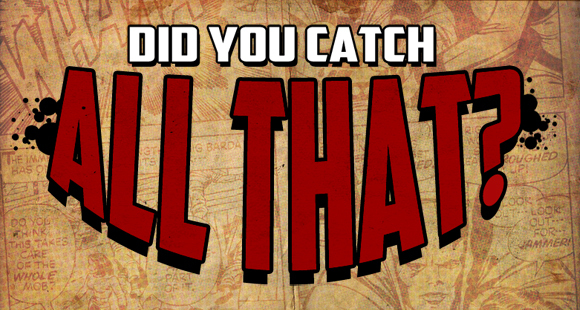 Well take some time off and relax and watch this all-new episode of “Did You Catch All That?” In this episode Sheldon and Simon explore the top five selling comics of the previous month. We also check out some 2012 San Diego Comic Con exclusives you don’t want to miss out on plus find out what two comics both of the boys loved for the month of June! I will give you a hint, one is going to be an instant classic and the other is based on a classic. That’s not all! Wanna know some of the latest rumors for new creative teams that MIGHT be coming to Marvel? Look no further. All this and Simon tell us about Terry Moore’s Rachel Rising and Sheldon explains why Iron Fist is one of his favorite characters in comics and that is just the start of the show. Whew! This is a busy month full of unfortunate comic TV shows getting cancelled and hey we even have a copy of Grant Morrison’s book Supergods to give away! so keep watching to find out how you can win it! And don’t forget to ask every month we will be asking you Did You Catch All That?! San Diego Comic Con 2012 News. Jim Lee back on wildcats? Batman 1960’s Tv Show on DVD.